Student loan debt can be a drag on your finances but you are not alone because it’s an anchor that weighs down around 40 million other Americans too. If you could pay lower interest rates on your student loans, the savings could add up to more than a pretty penny over the long term and that’s where Earnest comes into play. Earnest student loan refinancing is well worth exploring if you believe your are paying too much in student loan interest costs because the rate you pay and your approval are based not solely on your current financial situation but also on your future earnings power. But interest rates are just one thing to consider when choosing a student loan refi. In this Earnest loans review, you will find out how much you can borrow, loan terms, and tips on boosting your chances of loan approval. Why Opt For Student Loan Refinancing? Do I Qualify For An Earnest Loan? A student loan refi is designed for borrowers who want to switch out an existing higher rate student loan with a lower rate loan. If you are a good credit borrower and already have a federal student loan, you may be lumped into a category of borrowers paying higher rates relative to your theoretical risk level. After all, if you have a history of paying your bills on time, growing your bank balances monthly, and generally showing financial responsibility, why should you be penalized by paying the same rate as someone who pays late and spends more than they earn. Where Earnest wins brownie points is by serving customers who have a history of demonstrating financial responsibility and have good career earnings potential. With that said, if you expect to use federal student loan benefits, like income-based repayment plans, an Earnest loan may not be the right choice for you. By switching a federal student loan to a loan from a private lender, like Earnest or CommonBond, you lose those federal loan perks. If you are not employed or don’t have an offer of employment, you may need to rely on the federal safety net of an income-based repayment plan. Then it might be best to simply stand pat and stick with your existing student loan. Earnest claims that clients who refinance save on average $30,939 based on a principal balance of $75,000. 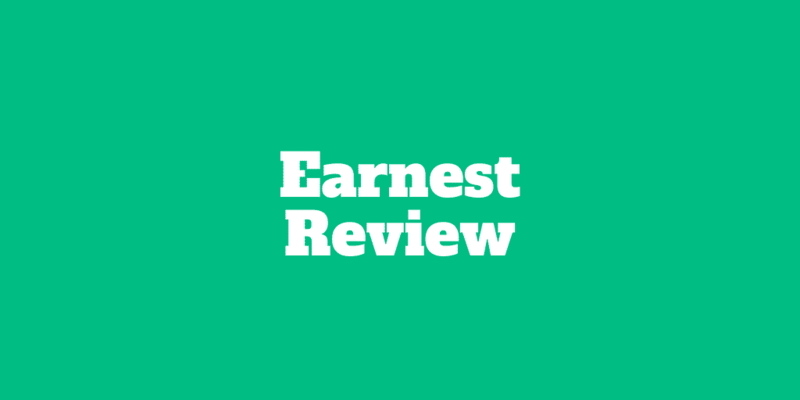 Earnest does not charge any origination, prepayment penalty, or late fees. To qualify for an Earnest student loan refinancing, you will need to have good credit. If you are not sure whether you meet the minimum credit score of 650, check out your rate with MyFICO®. Earnest requires you to be in good financial standing to be eligible for a loan refi. And that means you are current with rent or mortgage payments, your student loan accounts are in good standing, and you don’t have a bankruptcy on your credit report. Other factors that affect eligibility include having any accounts in collection as well as your history of on-time payments over the past 6 months. To qualify for loan refinancing, you will need consistent income, be employed or have an offer letter of employment that begins within the next 6 months. Like CommonBond and SoFi, Earnest requires that existing student loan debt stems from paying for a Title IV accredited school. You must be at least 18 years old to qualify and be a U.S. citizen or Permanent Resident. You must also be enrolled less than half-time or be set to complete your degree at the end of the semester. Other lenders like CommonBond may be a better fit if you live in any of these states or have Sallie Mae loans, which Earnest will not refi. You might be wondering what happens if you are struggling to keep up with your student loan repayments. Earnest provides a variety of repayment options. For example, if you are running late on a payment you can move back the date by up to 7 days. Active military personnel and Peace Corps personnel may be eligible to defer payments for up to 3 years but keep in mind that interest continues to accrue during this time. If you are struggling to keep up with payments, you may elect a repayment option whereby you omit one payment per year (when paying monthly). The obligation doesn’t disappear, however, but is instead amortized across your remaining payments. If you lose your job or receive a pay cut or suffer some other involuntary loss of income, Earnest permits you to choose a forbearance option for up to three months in any twelve month period. You may qualify for forbearance also if necessary living costs, such as child care or medical bills, increase dramatically. Other costs may qualify so if you do find yourself having to pay more out of the blue for necessities, contact Earnest to explore your repayment options. ✅ Low Interest Rates: Earnest is famous for providing highly competitive fixed and variable rates. ❌ Coverage In 45 States: Earnest offers loans in all states except Alabama, Delaware, Kentucky, Nevada, and Rhode Island. ✅ Approval Process: Unlike most lenders who evaluate your current financial situation only, Earnest pays attention to your future earnings power too. ❌ Sallie Mae Loans: It is not possible to refinance Sallie Mae loans with Earnest. ✅ Fees: No origination/application, late, or prepayment penalty fees are charged by Earnest. ❌ No Co-signer Support: Earnest does not permit co-signer support. ✅ Flexible Forbearance Period: Hardship forbearance is offered for up to 3 months in any 12 month period. ❌ Accredited Schools Only: If you did not attend a Title IV accredited school, you will not be eligible for an Earnest loan. ✅ Repayment Options: Depending on your circumstances, it may be possible to skip payments, defer payments, or postpone payments for fixed time periods. ✅ Parent PLUS Loan Refinancing: Parents who borrowed PLUS loans to help children can refinance loans. ✅ Loan Amounts: Anywhere from $5,000 to $500,000 can be refinanced. ✅ Modify Payments Online: Choose monthly or increase your minimum payment amount online at any time to speed up your payoff period. ✅ Customized Timelines: You can select a specific payment amount to suit your needs even if it results in a “weird” payoff timeline (for example, if it takes 9 years 5 months to pay off). Whether you already have a student loan or you are a parent with a PLUS loan looking to refinance, Earnest is among the new crop of private lenders, like SoFi and CommonBond, who offer highly competitive interest rates. Even if you are simply looking to consolidate credit card debt or pay for upcoming home improvements, Earnest personal loans may be an option as long as you have good credit. Provided you have a history of demonstrating financial responsibility, you stand a good chance of receiving approval from Earnest, who won’t ding you with as many fees as many traditional student lenders. While Earnest gets top ratings in almost every category, it does not issue loans in every state so check above to see if your state is excluded. Another “blot on the Earnest copybook” is its lack of support for Sallie Mae loans. Lastly, no co-signer support is available so you will need to qualify on your own financial merits. Once you are approved, you will be eligible for generous repayment options and a top notch customer experience that lets you modify payment amounts online and even select specific payment amounts to meet your financial needs. ‹ What Is A Springing Power Of Attorney?